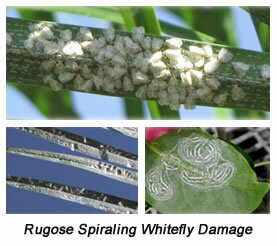 Grants Gardens Landscape Maintenance Protects Against The Rugose Spiraling Whitefly. Written by ddgadmin on 1 January 2013 . Posted in News. If you have never heard of the Rugose Whitefly then count yourself lucky. This pesky insect is causing problems for many tropical plants in Florida landscapes including gumbo limbo trees, banana trees, black olive trees, mango trees and palm trees. This Whitefly is also a problem for shrubs including copperleaf, cocoplum, wax myrtle, and other plants. You can spot this pest as the leaves of infested plants will be covered with a whitish waxy substance. The larva of Rugose Spiraling Whitefly arise from eggs attached to the plants leaves in an unsightly spiral pattern. To make matters worse the bugs excrete a sticky goo called “Honey dew” similar to aphids, this intern usually brings black mold which will feed on the honey dew. The troublesome insects usually congregate on the underside of the leaves making spraying with traditional insecticides much less effective. If a homeower spots Whitflys on their Palms or shrubs they can be blasted off the affected plans with high-pressure water, however once established the Rugose Whitefly is difficult to get rid of. Fear not though, the Landscape maintenance teams at Grants Gardens are experts on controlling these pests. Our landscape maintenance teams can treat the plants and keep the WhiteFlys from coming back. If you have noticed Whiteflys setting up shop in your palms or shrubs, contact Grants Gardens and our landscape professionals will keep your plants healthy and pest free.